Whether you celebrate Passover or Easter or Cherry Blossoms or spring, I hope everyone had a wonderful holiday weekend! Mine felt soooo long, which is essentially the goal of every weekend…#winning! On Saturday LLC and I walked all over DC. It was mostly shopping-related: I started with two grocery stores in search of rhubarb (fail – apparently it’s not time yet, or I missed my window? ), then we bought pretty spring clothes in Georgetown, then we got Passover cupcakes (i.e. flour-less chocolate decorated with Stars of David) and lounged on the Georgetown Waterfront, then we walked back to my house and then all the way up to Target in Columbia Heights. Weeks ago we’d marked Cherry Blossom Fireworks on our calendars, just as an if-we-don’t-have-anything-else-going-on-maybe-we-should-do-this? note. So when on Saturday night we didn’t have anything else going on…fireworks? Sure, why not? It was us and the tourists at the Southwest Waterfront Festival: Light-up paper mache-covered carp boats, fire baton twirlers, yachts decorated in pink lights, and of course fireworks! 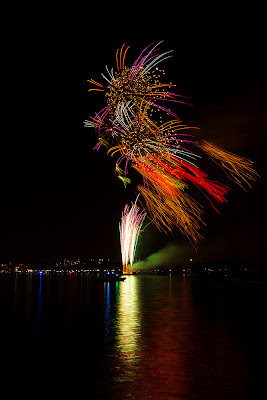 The fireworks were from Nagaoka City, Japan, “a city renowned throughout Japan for its two day fireworks festival, created especially for the 2012 Centennial.” (So basically, this got me excited for 4th of July!) It was great, I really really love fireworks. A Happy Cherry Blossoms to you all! And of course, Sunday was Easter. There was no egg hunt for us (I am still scarred from my childhood.) Like the adults we are, my friends and I celebrated with a lovely brunch chez LOTR-Emily. The weather cooperated so we could sit outside and enjoy a spinach and goat cheese frittata, LLC’s chocolate waffles (recipe tomorrow), lots of strawberries and cheese, and some stray care-package chocolates. Brunch took up most of the day (us: How is it already 4pm??? ), leaving me just a few more weekend hours to savor. I rounded out my Sunday with my first Meridian Hill Park Drum Circle of the season. I did a crossword while listening to the drummers and watching the dancers – it was excellent.